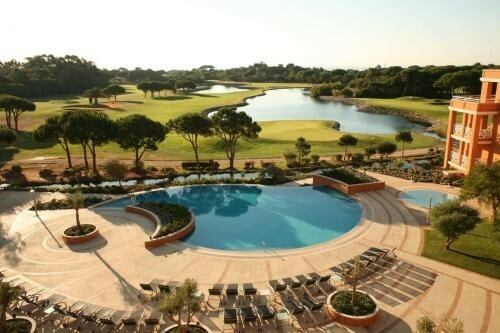 The hotel, holiday villas, 18-hole golf course, a Health Club, 6 tennis courts, several swimming pools - in an estate of 250 acres. Restaurants bars, and supervised 'Kids Club'. Discount rates for online booking. 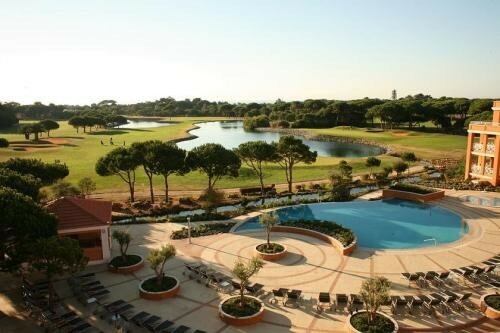 The aromas of the sea combine with the pine forests for guests to enjoy in the 5-Star Hotel Quinta da Marinha Spa & Villas Golf Resort. There are 192 rooms and 8 suites in this special tranquil area outside Cascais on the mouth of the River Tagus and comfortably within reach of Lisbon. The hotel with its townhouse villas, 18-hole golf course, a Health Club, 6 tennis courts, several swimming pools and other sport facilities are all set in an estate of 250 acres bordered by a Nature Reserve. The Resort has a wide variety of restaurants providing a choice of gastronomic menus to tempt the taste buds. A selection of bars offers the chance of a relaxing drink. During the summer there is a supervised 'Kids Club' to occupy the younger guests. Robert Trent Jones designed the carefully maintained par-71, 18-hole golf course. This 5.845 metre course takes you past peaceful lakes and through scented pine trees, with attractive views of the hills on one side and ocean on the other. Visiting golfers can also play at the various other courses all within several minutes drive or improve their technique with lessons from our resident Golf Pro. The Tennis Club has an tennis school active during the whole year. There are 3 outdoor swimming pools, one at the hotel, and the others which are salt-water swimming pools at the Atlantic and Club House. 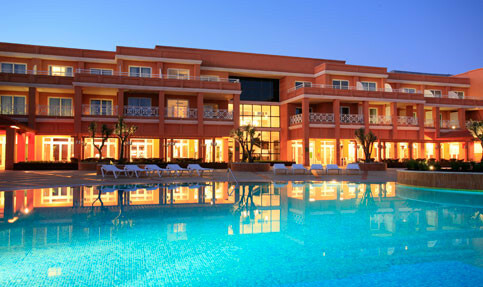 The Health-Club & Spa has a gym, sauna, treatments, Jacuzzi, massage service and hairdresser, and an indoor swimming pool. Your choice - real relaxation or be active - this is an ideal location. This air-conditioned room comes with a balcony. 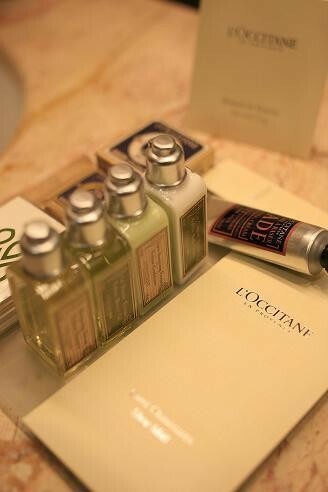 Equipped with a satellite TV, minibar and a private bathroom with free toiletries. Please note that this room type cannot accommodate any pets. This offer includes: - buffet breakfast in Restaurant Five Pines - free Wi-Fi - free newspaper upon arrival - discount on laundry service - early check-in/Late check-out (upon availability) - free access to the Health Club with sauna, Turkish bath, gym, indoor and outdoor pool. Please note that this room type cannot accommodate any pets. Spacious accommodation on 2 floors, featuring a separate living room and a fireplace. This villa can accommodate 1 extra bed for an extra fee. Guests are kindly requested to contact the hotel for extra details. This romantic offer includes a continental breakfast, strawberries, sparkling wine and flowers. Please note that this room type cannot accommodate any pets. Includes: - Buffet breakfast at Five Pines restaurant - Welcome fruit basket and mineral water in the room - 25-minute spa treatment per guest (selected treatments) - Access to Health Club with sauna, Turkish bath, indoor pool and gym - Access to outdoor pool - Private parking. Please note that this room type cannot accommodate any pets. This spacious suite has a seating area and a terrace. This suite can accommodate 2 adults and 2 children up to 12 years of age. Please note that this room type cannot accommodate any pets. This room can accommodate 2 adults and 2 children up to 12 years of age. Please note that this room type cannot accommodate any pets. Spacious accommodation on 2 floors, featuring a separate living room and a fireplace. This room can accommodate up to an extra bed to be shared by 2 children under 12 years old. Guests are kindly requested to contact the hotel for extra details.